UNISON has once more launching a scheme to help members on low incomes deal with the cost of buying school uniforms. Families living on low income with children struggle constantly to make ends meet – and this can be particularly acute before the new school year begins when the extra costs hit hard. 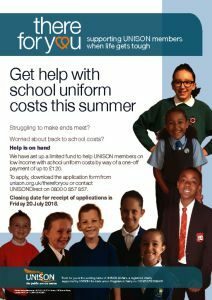 The Union’s welfare charity There for You has a limited fund to help members deal with the costs of school uniforms. Applications are open now and the closing date is Friday 20 July 2018. Branch members who would like to apply for the Grant or are looking for further information please contact the Branch Welfare Officer, Carole Watt at the Branch Office, telephone 01475 715900. Please click on the link below for Questions and Answers information.